The Breckland parish of Great Ellingham is situated in the southern part of Norfolk, next to the parish of Attleborough, some ten miles southwest of Norwich. Its name comes from the Old English for ‘The homestead of Ella’s or Eli’s people’. The parish has a long history of human occupation, and was certainly well established by the time of the Norman Conquest, its population, land ownership and productive resources being recorded in the Domesday Book of 1086. The earliest evidence of human activity in the parish comes in the form of a Palaeolithic flint handaxe (NHER 9072). Exactly where and when it was found are not known. Prehistoric but otherwise undateable flint tools have also been found, including flakes (NHER 9074) and a scraper (NHER 28016). Several prehistoric scatters of burnt flints, thought possibly to have been used for heating water for cooking or other purposes, have also been noted, for example NHER 9074, 9076, 9107, 28015 and 41714. There have been no Mesolithic finds in the parish to date, and the next evidence for activity we have is flint tools from the Neolithic. These include chipped axeheads (NHER 9073, 9074 and 9078), polished axeheads (NHER 9079, 9164 and 22436) and a scraper (NHER 22923). The Bronze Age in Great Ellingham gives us evidence, although very tentative, of the parish’s earliest structures. These are the remains of circular burial mounds, or round barrows. A group of these were marked on old maps of the parish, but have since been completely destroyed by ploughing (NHER 9081). However, even if a barrow has been ploughed flat, often its surrounding ditch can still be seen from the air as a ring ditch; an example of one of these (NHER 12803) has been noted to the south of Cherry Tree Farm. Small finds from the Bronze Age include a copper alloy palstave (NHER 39946), a spearhead (NHER 9080), an axehead (NHER 42548) and a piece of a rapier (NHER 42547). Also, fieldwalking and metal detecting at the northeastern end of the parish since 1995 have recovered a Late Bronze Age hoard of copper alloy objects, including socketed axeheads, ingots and sword fragments (NHER 31588). It is not uncommon for the Iron Age to leave little or no trace of its passing, and in Great Ellingham it is true to type. The only finds from the period are some pottery fragments (NHER 28015) and a harness fitting (NHER 21709). The Roman occupation from AD 43 has left evidence of the earliest buildings in the parish. Of course, nothing at all remains of these structures, but concentrations of Roman pottery, building materials and other finds in an area indicate their former presence. Two such concentrations have been noted in the south of the parish, at NHER 9082 and 9083. The first of these sites is of considerable interest, showing human activity from the Neolithic right through to post medieval times, and indicating that the site of the Roman building was later used as an Early Saxon cemetery. Small finds from the Roman period include pottery fragments (NHER 9085 and 22923), brooches (NHER 22923, 34905, 41761, 43116 and 44086), coins (NHER 9084 and 22922), a finger ring (NHER 22922) and a lead weight (NHER 23804). Saxon finds include tweezers, a sword pommel and a gold finger ring (NHER 9082 again), brooches (NHER 34905), an unusual key (NHER 9106) and a wrist clasp (NHER 42548). The medieval period following the Norman Conquest has left the parish with its oldest surviving building, St James the Great’s Church (NHER 4259). This is a mainly 14th century building with much attractive chequered flintwork and a battlemented west tower topped by a lead spire. Inside, there is a 14th century octagonal font with its original lead lining, part of a 15th century painted screen and various medieval wall paintings. It is unusual for medieval residential buildings to survive, and so Great Ellingham is fortunate in having three properties that, although much altered since, have their origins in this period. Mill Farmhouse (NHER 24605) and Tannery Farm (NHER 30928), timber framed and thatched buildings, both started life as 14th or 15th century hall houses, and Ye Olde Thatche Shoppe (NHER 40344), another thatched building, was originally two 15th century cottages. Some medieval houses do not survive, but have left a footprint in the form of their surrounding moat. An example of this is NHER 34571, the site of a moated manor. Although no trace remains of the central residence, the moat is still visible. Other buildings, and indeed an entire settlement have disappeared. Tofts deserted medieval village (NHER 11925) has so effectively vanished that its exact location is not known. Of the surviving post medieval buildings in the parish, probably the oldest is Old Hall (NHER 9108). Built in the mid 16th century for one of the Gurney family, this is a house of great character and history, standing on the site of an earlier moated manor. Slightly later, but of the same century is Bury Hall (NHER 34180). Manor Farmhouse (NHER 35184), an ornate timber framed farmhouse, dates to about 1630, its north elevation given a brick skin in 1780. Rose Farmhouse (NHER 19427) is mid 17th century, Portwood Farm (NHER 17170) a little later. Church Farmhouse (NHER 23620) is early 18th century, but built with reused 16th and 17th century beams and a 17th century ceiling from another house. The Old Queen’s Head (NHER 40806) is also early 18th century. Originally built as two workers cottages, it was used as a beer house in the 19th century, and is now a private house. There is only one industrial post medieval building left in the parish, the shell of a mid 19th century six storey tower mill (NHER 4258) south of Church Street. This was last used in the early 20th century, but there have been proposals in the last few years for it to be restored and converted to residential use. 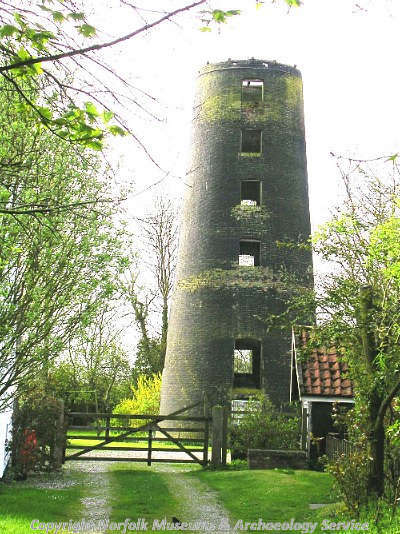 There was another windmill in the parish, to the west of the village, but this has not survived and is only visible from the air as a D shaped mark (NHER 9104). To the west of the parish, just south of the B1077 as it heads to Attleborough, is a late 18th century cemetery (NHER 40807), an early example of a Baptist burial ground. The most historically recent entry on the records for the parish is Deopham Green Airfield (NHER 4260), set in the northwest of the parish and spilling over into Hingham and Deopham. Sometimes known locally as Ellingham Airfield, this was from 1943 home to the 452nd Bomb Group of the United States 8th Army Air Force, equipped with B17 Flying Fortresses and flying missions over Europe. Handed back to the RAF in 1945, it was closed in 1948 and sold off in 1959. Several concrete runways, hangars (one of which has contemporary murals) and an air raid shelter remain. It should be emphasised that this is very much an overview of the archaeology of the parish. Those wishing to dig a little deeper should consult the full records. Piet Aldridge (NLA), 6 April 2006.